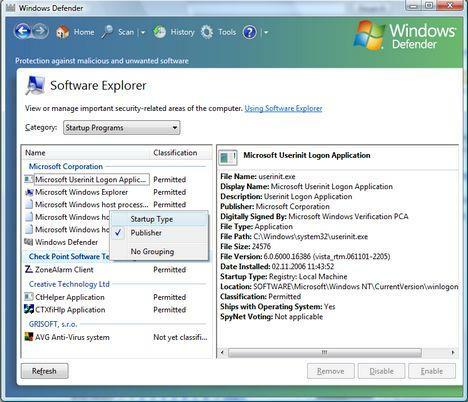 Launch Windows Defender, click on Tools and then on Software Explorer. Now you can monitor all the programs that are running on your computer. 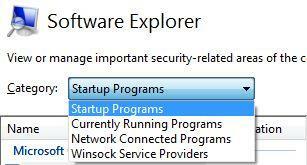 Software Explorer will load by default the list of startup programs. You can also view a list with all the running programs, another one with the network connected programs and all your Winsock services providers. To access any of these lists, go to the Category drop-down list and select the one you want to check. The startup programs list can be grouped by Startup Type and by Publisher. For our tutorial we grouped all items by Startup Type. The list of startup programs will be split depending on the location where the programs are registered to start automatically when Windows Vista starts. As you can see in the screenshot below, our startup programs are registered in the Current User registry keys and in the Local Machine registry keys. The application registered in the Current User registry keys will start automatically only for the current user while the others will start for all users registered on the PC. 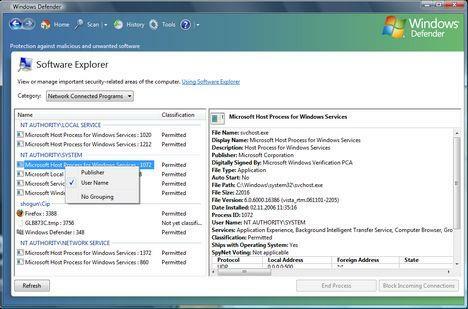 If you click on any of the startup programs, Windows Defender will show you in the right side panel a complete list of information about that program. 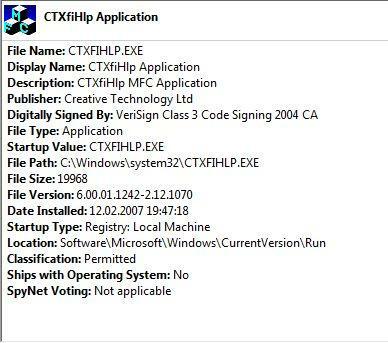 You can see the file name, the publisher or the date when the program was installed. Windows Defender also lets you know if the program was shipped with your operating system or not. In case you detect an unknown program, the SpyNet Voting field might help. 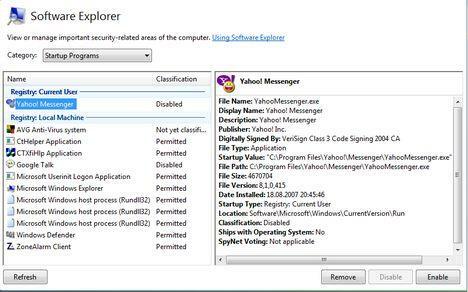 If the program has been classified as a risk then you should definitely disable or remove that startup program. 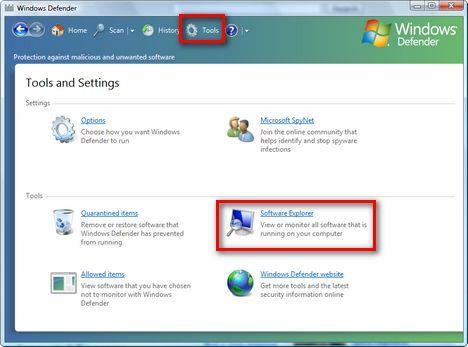 You can use Windows Defender not only to remove suspicious startup programs but also to easily review and disable the programs that you don't want to start automatically with your Windows Vista. There is no need to edit the Windows Registry. 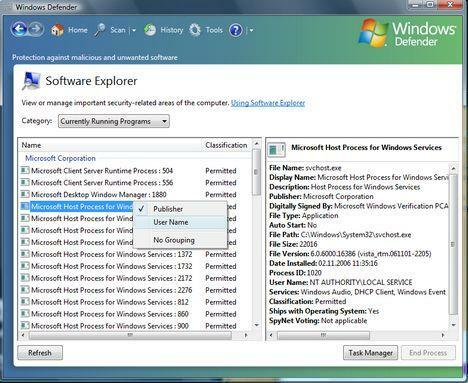 You just launch Windows Defender, check information provided and disable all the unwanted programs with one click. Windows Defender can also be used as a secondary Task Manager. In Software Explorer choose the Currently Running Programs category and you will see the complete list of running applications. You can always group this list by Publisher and User Name. For this article we grouped all the programs by User Name. This way you can make an easy distinction between the programs launched by the system and the ones launched by your user. 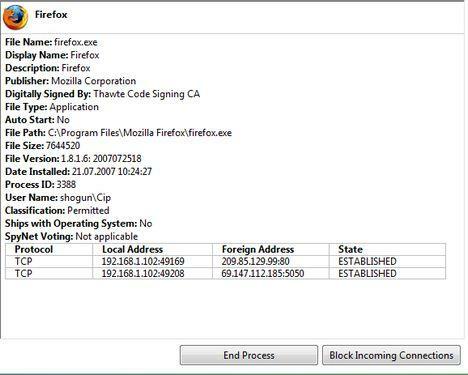 You can see the complete set of information about each running program and you can also terminate programs that run in the user context. All you have to do is to select the program you want to terminate and press the End Process button. As a safeguard, you won't be able to terminate any programs launched by the system or by the network service even if your user is an administrator. Knowing which applications are using the network and the addresses to which they are connected is easier than ever with Windows Defender. 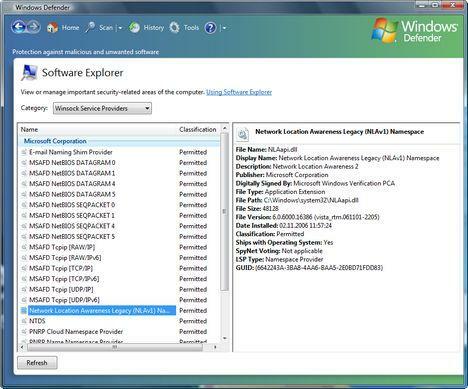 Just select Network Connected Programs in Software Explorer and you will have the complete list. Just like for the other categories, you can group the programs listed by Publisher and User Name. When you click on a program, you will see all the usual details plus the complete list of protocols used by the application and the addresses to which it is connected. You can also see the ports used for all connections and the connections status. In case you want to, you can block all the incoming connections for a specific application or you can terminate it by clicking on the End Process button. The list of Winsock service providers might not be very useful for most people, but some power users might beg to differ. The users searching for this kind of information will find here all they need to know about each winsock service provider. As a quick mention for those of you who don't know, Winsock service providers are programs that perform low-level networking and communication services for Windows and programs that run on Windows. I would rather manage my own system until this program is better debugged. It has actually slowed my start up significantly and when I run certain online programs off my desktop, it crashes my entire computer. No where can I find how to get rid of it. I am very displeased with this program as there are still some major bugs with Vista. There are alot of functionality addons needed so as to better manipulate this program. I had no issues until Windows Update added this. 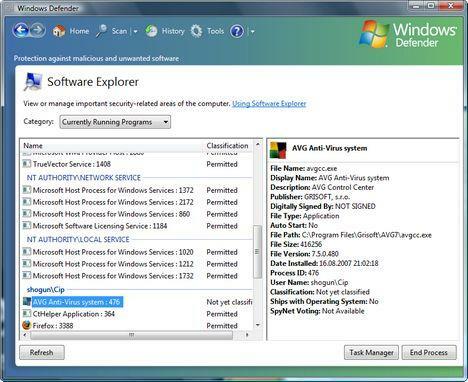 Windows Defender's "best feature" was unfortunately removed in Windows 7.